We are a team of Siberians managing an incoming travel services to Siberia, Lake Baikal & Buryatia. Perhaps as you, we are dedicated to travel all around our planet. Being the native of lake Baikal we wish you to experience the spirit of this sacred sea. Having been to many places we still enjoy visiting them again trying to get the most out of independent travel activity. We are pleased to invite you to join us to explore this beautiful scenic land, its wildlife and culture of people that inhabit it. 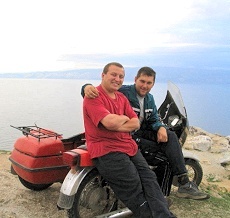 The major objective of BaikalEx.com is to provide comprehensive personal service for individuals and groups, accurate and easy information support for everybody planning a trip to/through Lake Baikal region. BaikalEx offers holidays which are inspiring to travellers and bring benefits to the local people, wildlife and environment of the destination. As an adventure travel company, BaikalEx's philosophy is to provide excellent value for money without compromising travellers' experiences and offering quality transportation, boats, equipment, and crew. We are all 'active travellers by occupation' able to play different and every roles, but working as guides will never be holding your hand every step of the way. We always try to offer flexibility and independence to our guests. So, get out and experience things for yourself, read the guide books, walk in taiga forest or go to the beach and party, get lost in markets, meet the local people and talk to them - its all part of the experience! As a company we try to remain small and compact to keep our overheads low. We do not waste money on high city offices, printing glossy brochures, not busy doing amazing discounts or having a large team of administrative staff. We just run good trips that are value for money. Call to us (during office hours) and you will speak to someone straight away. Far away in Siberia, with excellent boats, jeeps and crew there is a better chance to have an unforgettable and safe time! Copyright © 2000-2014 BaikalEx. All rights reserved.